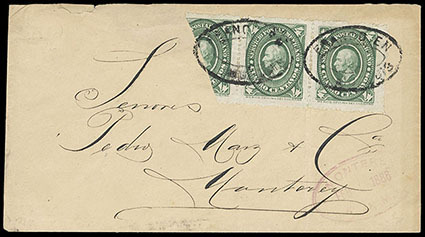 Mexico, 1884, Hidalgo Medallion, 4c green, diagonal bisect se-tenant in pair, on cover to Monterrey tied by "Franco En V. Muzquis" oval handstamp (33/3), 1888 violet receiving date stamp; most of backflap missing, Very Fine, likely to be a unique se-tenant bisect usage. Scott No. 153b, 153 Estimate $300 - 400. Mexico, 1884, Hidalgo Medallion, 4c green, imperf between, two pairs, one vertical and other horizontal, purple "Impression Del Timbre, Mexico, 22 Ene, 84" handstamp on front or reverse, Very Fine. Scott No. 153c, 153 var. Estimate $250 - 350. 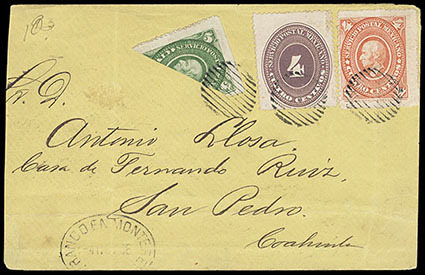 Mexico, 1884, Hidalgo Medallion, 5c green, diagonally bisected, in combination with 1885, Hidalgo Medallion, 4c red orange + 1886, Numeral, 4c lilac on cover to San Pedro, each tied by grid handstamp with matching Monterey oval date stamp at bottom; cover reduced at left, F.-V.F., the only recorded bisect and 1885 & 1886 mixed issue franking combination. Scott No. 154 var+168+177 Estimate $300 - 400. 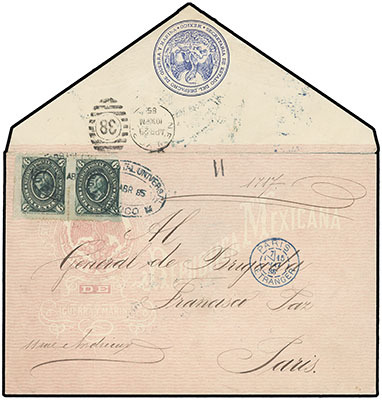 Mexico, 1884, Hidalgo Medallion, 6c "black green", horizontal pair, corner nick at upper right, tied by blue 1885 Mexico oval date stamps on pink red allover "Secretaria De Estado Y Del Despacho De Guerra Y Marina" shaded official cover to Paris, France, N.Y. transit backstamp and blue receiving date stamp on front, Very Fine, a scarce deep green shade usage, ex-Schimmer. Scott No. 155 Estimate $400 - 600. 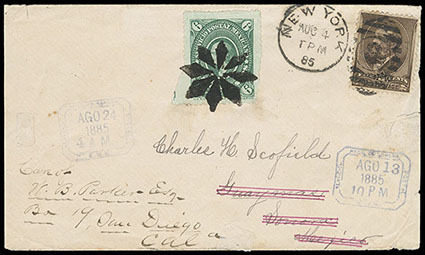 Mexico, 1884, Hidalgo Medallion, 6c green, tied by bold fancy circle of diamond handstamp on forwarded cover to San Diego, Cal., initially addressed to Guaymas franked with U.S. 1882, 5¢ Garfield tied by 1885 New York duplex date stamp, reverse with Guaymas forwarding date stamp and Nogales transit date stamp on front; small cover reduction at left, Very Fine, very few mixed franking covers exist of this issue. Scott No. 155 Estimate $250 - 350. 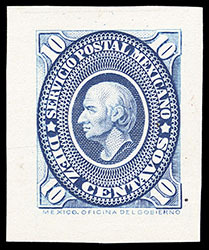 Mexico, 1884, Hidalgo Medallion, 10c blue, trial color large die proof on card, 30x35mm, bright and fresh, Very Fine, very rare and possibly unique. Scott No. 156TC Estimate $300 - 400. 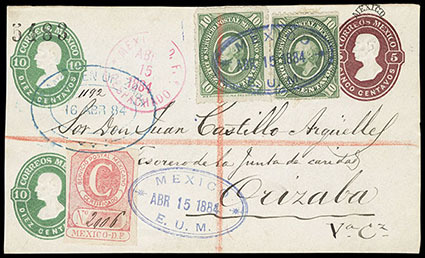 Mexico, 1884, Hidalgo Medallion, 10c green, two singles, on a compound 10c+10c+5c "Mexico" overprint postal registered front to Orizava bearing the rare red "C" first UPU registration label, with "Mexico, Abr 15, 1884" date stamps and next day receiving date stamp, Very Fine, the custom of cutting the front as proof of delivery and signing on the back had been discontinued by 1884 yet this registered front was used that way. Scott No. 156 Estimate $150 - 200. 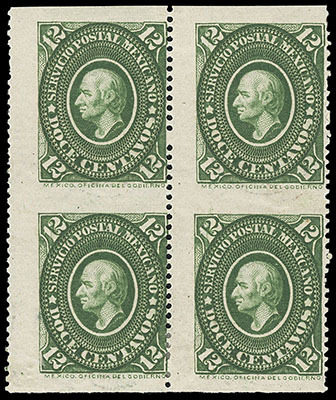 Mexico, 1884, Hidalgo Medallion, 12c green, imperf between, block of 4, o.g., rich color, Fine, this error is known mainly from a few unused pairs, this block may be unique. Scott No. 157a $500 for pairs. 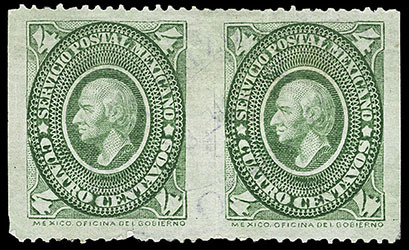 Mexico, 1884, Hidalgo Medallion, 12c green, imperf between, vertical pair, tied on piece by San Miquel oval handstamp, Very Fine, this error is known mainly from a few unused pairs, this used one may be unique. Scott No. 157a; $350 Estimate $150 - 200. 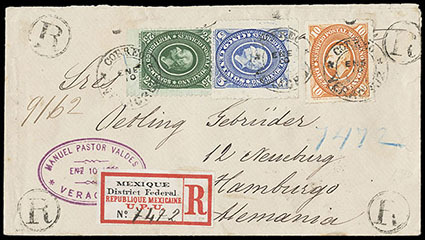 Mexico, 1884, Hidalgo Medallion, 25c green, in combination with 1885, Hidalgo Medallion, 5c blue + 10c red orange on 1886 registered cover to Hamburg, Germany, all tied by Veracruz cds with matching R in circle handstamps at edges, registry etiquette and reverse with Mexico transit and receiving date stamps, Very Fine. Scott No. 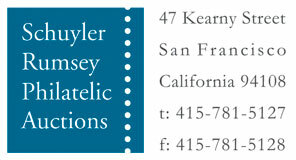 159+169+171 Estimate $200 - 300.